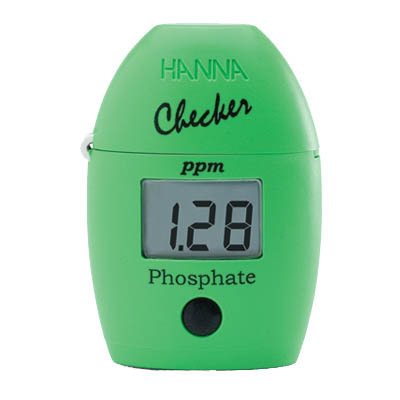 The new Hanna Instruments phosphate colorimeter has just been released. This great new reef tool, is easy to use, and more accurate than chemical test kits. This new portable handheld colorimeter features a resolution of 0.01 ppm (250 points), 4% ±0.04 accuracy of reading and an easy to read LCD display. An auto shut-off mechanism, will promote long battery life. At less than $40, this Digital Phosphate checker is a terrific value, making it a reef took every hobbyist aught to have. With it’s one button operation, this simple reef tool will make at least one of your parameter testing a breeze. Easier to use and more accurate than chemical test kits Adaptation of Standard Method 4500-P E Accuracy 4% ±0.04 ppm (mg/L) of reading 0.04 ppm (mg/L) resolution (250 points) Large, easy to read digits Auto shut-off. Dedicated to a single parameter Designed to work with HANNA’s powder reagents Uses 10 mL glass cuvettes. Small Size, Big Convenience Weighing a mere 65 g (2.3 oz. ), the Checker®HC easily fits into the palm of your hand or pocket.Use for quick and accurate on the spot analysis. Single button operation: Zero and Measure Operated by a single AAA battery. Ideal for Natural, waste and drinking waters. Orthophosphates are found in natural and waste waters. They are commonly added to drinking water as a corrosion inhibitor. The instantaneous analysis of orthophosphate by colorimetric determination provides rapid results using a standard analysis technique. The HANNA HI 713 Checker®HC bridges the gap between simple chemical test kits and professional instrumentation. Chemical test kits are not very accurate and only give 5 to 10 points resolution while professional instrumentation can cost hundreds of dollars and can be time consuming to calibrate and maintain. The HANNA HI 713 Checker®HC is accurate and affordable. The HI 713 Checker®HC portable handheld colorimeter features a resolution of 0.01 ppm (250 points) and 4% ±0.04 accuracy of reading. The HI 713 Checker® HC uses an adaptation of Standard Method 4500-P E. The contoured style of this Checker®HC fits in your palm and pocket perfectly and the large LCD is easy to read. The auto shut-off feature assures the battery life will not be drained if you forget to turn it off. The HI 713 Checker®HC is extremely simple to use. First, zero the instrument with your water sample. Next, add the reagent. Last, Place the vial into the HI 713 Checker®HC, press the button and read the results. It’s that easy. I have a saltwater tank that always seems to have an issue with phospate. I used to use an unreliable kit I purchased at the Pet Store. I purchased this Hanna Product and now have an easy to use, affordable option that works great.